Generating usable electricity with just the normal amount of heat emanating from a person’s body seems like a far-fetched concept. However, a team of researchers at South Korea’s Electronics and Telecommunications Research Institute (ETRI) recently announced that they have created a wearable thermoelectric generation system that converts human body heat into electricity. According to the research team, their technology is expected to enter the commercialization stage within these two to three years. For the time being, the successful demonstration of this invention opens up the possibility that people will be able to literally self-produce an unending supply of clean electricity for powering their wearable and mobile devices. The thermoelectric generation system developed by the research team at ETRI comprises of a small thermoelectric module (officially called a “thermoelectric element”) and a biomimetic heat sink that is fitted to the underside of the module. The former is the main device that converts heat emitted from the human skin into electricity. The latter, which is a patch-like structure laid between the skin and the module, maintains a temperature difference that is essential for the generation process. The team at ETRI stated that the biomimetic heat sink is the core technology of the whole system because it creates a large temperature difference that maximizes the energy efficiency of the module. In fact, the biomimetic heat sink helps increase the output of the thermoelectric modules by 500% (compared with the level that the module can achieve by itself). The module also contains power management ICs that keep the energy efficiency of the module above 80% even when the electricity is generated at very low voltages. At the same time, these ICs can ensure that the power output is at the suitable voltage for charging electronic devices. The dimensions of the module is quite compact, measuring 11 centimeters in length and 5 centimeters in width. Its power density is 35 microwatts per square centimeters, which is also 1.5 times higher than the result that US researchers previously achieved in the same technology field. When six modules work together as a unit, their total output can reach 2-3 milliwatts, thus reaching a level that is suitable for commercialization. 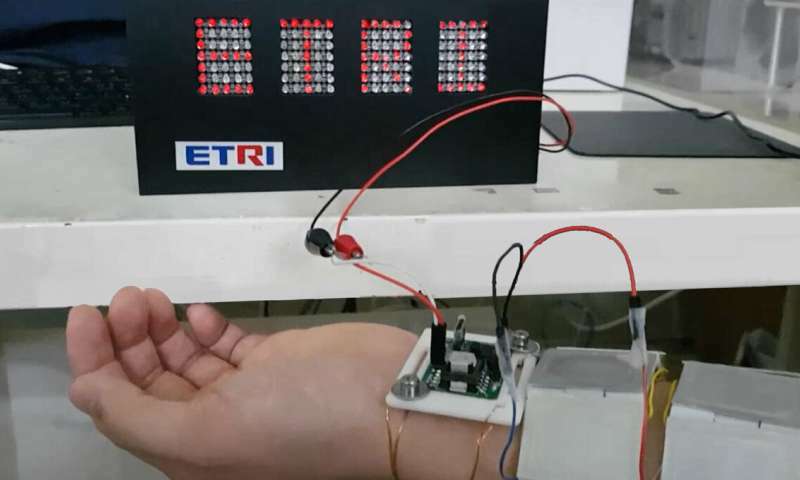 In one test, six modules attached to a person’s arm were able to light up the word “ETRI” on a LED display board. The research team at ETRI has further addressed the concern that the module with the biomimetic heat sink on its underside will have trouble clinging to the skin. Usually, patch-like devices that are attached to the skin can easily fall off or rip apart when their wearers are engaging in even the simplest physical activities like walking. ETRI researchers therefore have adopted a dry adhesion method that uses a nanostructure technology for the adhesive part of the device and a microstructure technology for the exposed part of the device (including the module). The nanostructure technology creates a strong and natural bond between the skin and the device, while the microstructure technology reduces the risk of the device being torn off or damaged during physical activities. ETRI is highly optimistic about the development prospect of its thermoelectric generation system. The research team is currently working on ways to integrate the various power management ICs into one chip so as to improve the appearance of the whole device and wearing comfort. The head of ICT materials and component research at ETRI stated that this thermoelectric generation system has the potential enter a wide range of applications when it is successfully commercialized. Besides wearables and IoT devices, the technology can also find uses in the areas of digital healthcare and smart home. An article about this invention from the technology news website Verdict refers to data from Futuresource Consulting when discussing the technology’s potential in the wearable market. According to Futuresource Consulting, the total annual shipments of wearable devices rose by 10% to surpass 100 million units in 2018. While the market is growing, there are technological challenges that constrains the consumer demand. Short battery life, in particular, has always been a serious disadvantage of products such as smart watches and smart bands. Thus, the wearable market would benefit greatly if scientists have developed a technology that efficiently converts human body heat into electricity. ETRI researchers said that they hope to have their technology incorporated into temperature and pulse sensors that monitors patients and infants. They even consider GSP tracking devices for pets as a potential application. Many public and private research agencies around the world are now looking at thermoelectric energy harvesting on human body because they see a lot of opportunities for this form of self-sustaining and clean energy. Taiwan’s Industrial Technology Research Institute (ITRI) has also made forays into this field, collaborating with private companies and universities in special projects. A notable example among the thermoelectric energy technologies developed by ITRI is an ultra-low voltage thermoelectric chip that uses the slight temperature difference between the skin and the surroundings to perform low-power electricity generation. This chip has significantly raised the feasibility of thermoelectric generation and expanded the variety of applications for the technology.